The LD400 Series miniature dc output LVDT transducers provide a method of measuring displacements up to ±5 mm (±0.20 inch) with very high accuracy and infinite resolution. They have a free-guided armature incorporating Acetal bearings, which provide near frictionless motion to detect the smallest movement the associated instrumentation is capable of identifying. 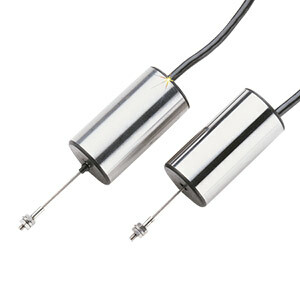 These transducers utilize a precision linear variable differential transformer (LVDT) as the measuring source, together with hybrid ICs which include an oscillator, demodulator, and filter; together, they comprise a self-contained unit that accepts dc input and provides dc output relative to armature position. The unit's high linearity and low mass of moving parts is ideally suited to applications in civil, mechanical, chemical and production engineering. * White and red in phase for positive inward displacement.